Should you buy Erectarack’s Module pipe racks or have it custom fabricated? If you’re in the market custom fabrication pipe racks, it’s important that you start with a good idea of how to acquire an accurate estimate. If you set out with vague plans and not enough questions and answers, you’re going to fall into one of the many pitfalls of custom fabrication. Whether you’re hiring a team for the simplest of welding projects or to produce cutting-edge technology, keep these six common pitfalls in mind. Perhaps the most common problem of all, and one with the potential for serious ramifications throughout your project. 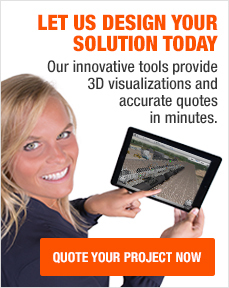 It’s crucial that you begin with finalized, complete, accurate drawings or prints for your fabrication estimate. You don’t want to be making changes and additions later in the project, as it will almost inevitably cost more and take longer than getting things right from the start—sometimes drastically so. Working with an engineer or designer to finalize your plans before seeking estimates is a smart move. Most fabrication teams will be familiar with common codes and inspection standards. However, if you set forth with estimates making incorrect assumptions about standards and codes your project needs to clear, you may encounter serious problems further along. Make sure your fabrication team understands the codes and compliances you must adhere to during production, what’s necessary to pass inspection with the final product of your fabrication, and what your fabrication team will need to do to meet those requirements to do the job properly. Check the latest listings for your project and go over the details with your fabricator. There are a ton of factors hidden behind the question of materials, which can cause extreme inaccuracies in your estimates should you ignore them. Make sure you understand and communicate the size, weight, and volume of materials and the final fabricated product. Perhaps even more important is the question of the myriad items which go along with your fabricated project; purchased items such as motors, bearings, and belts which need to be sourced by you or by the fabricator. If not provided by you, make sure you give proper time to your fabricator to source and obtain the additional items so they are factored into pricing estimates appropriately and save you rushed shipping costs. This is another easy area to slip up, as many projects have exacting demands for the finish which may not be represented in a generic fabrication estimate. Do your research and figure out what needs to be done to your final project beyond the fabrication; paint, epoxy, polish, and special coatings all need to be outlined and accounted for in any fabrication estimate. Failing to adequately plan for your finish can lead to estimates which are inaccurate in both cost and timetable; you don’t want to set a hard final date and reach it only to find out your project lacks a necessary finishing touch. Few areas offer as much opportunity to save and opportunity to lose as the scheduling and timelines. You want a very clear idea of how long your project will take from start to finish, how long you can wait to begin or wait to receive the final project, what other factors intersect with the fabrication scheduling. Not only does your fabrication team need to understand your needs and expectations to offer an accurate estimate, you need to understand these factors to give yourself leeway and minimize costs. Tight schedules and rush jobs will cost you more and create the potential for major problems to arise. Discussing timelines with your fabricator in advance can help you avoid rushed shipping charges which can also add cost or delay a project. Miscommunication about how a project will make it to its final destination can become a nightmare in a hurry. Make sure you know where your completed fabricated product needs to go and how it’s going to get there. Is the fabricator handling the delivery? If not, who is—someone the company sources for its deliveries, or someone you source on your own time? How is it being paid for, how is it being managed? If you’re not receiving the project as a delivery, and instead plan to receive it directly from the fabricator, you need to make that clear and receive thorough instructions on the process. If you’re leaving delivery to the fabricator, then you need to provide them with as much detail as possible on the destination, timeframe, special precautions, etc. An accurate estimate usually comes down to accurate information on your end. Plan thoroughly, communicate carefully, and you’ll come out ahead. Contact ErectaRack for a free estimate on your fabrication project today.